Join us for our East Coast Meetup! We are looking forward to meeting new Cotons and their owners at Millenium Park again this year! Contact Kels Lindsay if you have questions or need more details: cotons2@gmail.com. This year we are priviledged to have representatives from PET PARTNERS present information on therapy dog training. "Pet Partners is the nation’s largest and most prestigious nonprofit registering handlers of multiple species as volunteer teams providing animal-assisted interventions." If you have been considering pet therarpy with your Coton, this will be a tremendous oppourtunity to ask questions and learn! www.petpartners.org. Click HERE to download a map of the park showing our exact Meetup location. A Gathering for Cotons in Boston & Surrounding Areas. Join the fun meeting other Cotons & their owners at beautiful Millenium Park! Share stories, grooming and training tips. Please note: dogs must remain on leash at all times. Save the Date! Come and Play! Join us and meet Cotons and their owners in the Pacific NW & greater Seattle area! Share stories about our charming, white, fluffy clowns. Share grooming and training tips. 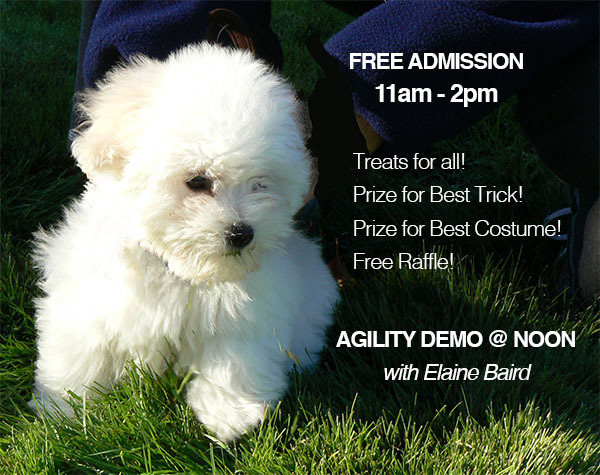 Agility & Rally Demo by Four Paw Sports! Win prizes for best trick and best costume. FREE RAFFLE for a brand new Sturdi-Bag carrier! Bring blankets/ chairs, a picnic lunch and goodies for your pups!